Oh the joys of homesteading! This past month has seen its share of normal obstacles to over come. 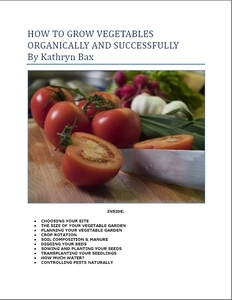 From cracked heels that are extremely painful if you have never had them, to bot fly worms or larvae lodged in the neck of a rabbit, to basic upkeep of the farm; it's always interesting homesteading in the summer! For those of you that suffer from cracked heels, I have found the best thing to do, is not go barefoot. I'm always running around without shoes and it seems this was the cause of my problem. Who would have thought it? Sleeping with Vaseline on my heels and wearing socks to bed, as well as in the daytime, has cured my problem. The bot fly larvae found in the neck of the rabbit was a bit harder to work with. I noticed one of my young bucks had some matted hair around his neck. After catching him up and shaving that area I noticed a swollen pocket with a live worm visible through what appeared to be a breathing hole for the worm. 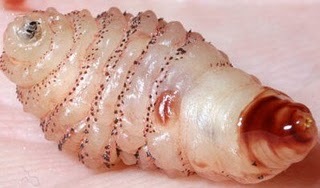 The bot fly larvae was easily removed. You do want to take care to get the whole bot fly larva their poisons can kill the creature they have burrowed into. The next issue was all the dead tissue left behind. Infection was there, but not bad. This was cured easily by simply cleaning the wound and flushing it with some warm salt water. The next step was to remove all the dead tissue possible. If I had known then what I know now, I would have cut the dead tissue out. At the time, I didn't know what it was so didn't know it was actually dead tissue. By the time this became evident the hole had shrunk to an extent it would have had to be re-opened to remove the tissue. I used Hydrogen peroxide and tweezers to eat away at the mass until the entrance hole became too small. At that point I simply allowed the wound to heal. A few weeks earlier I had a young doe die with what appeared to be puncture wounds on her neck. It seems she had an infestation of bot worms that killed her due to infection. Infection can happen so rapidly in high humid temperatures that rabbits need to be checked twice a say for bots. I learned this the hard way. The bot fly is not native to Iowa, where I live. Bot fly come from Central and South America. They capture a mosquito, lay their egg on the underside of the mosquito, and then release it. When the Mosquito bites an animal, the bot egg is also released, thus beginning the gruesome stage of development under the skin of its host. I believe it is due to the climate change that these insects whom normally infest horses, have become such a problem. We never used to have the humidity or high heat we do now. Things are changing that's for sure. Another issue we encountered this month due to the high heat was deaths. Many people I know had rabbits and other small animals die from heat exhaustion. Because all my birds and rabbits live under large oak trees and we are located on a small hill. There is also a breeze. That doesn't change the actual temperature however. Heat is a problem. Some of the breeds I have, I keep because they can stand out sever winters. This means in the summer, they suffer. My Flemish Giant rabbits are a prime example of this, great in the winter, not so much in the summer. I now have not only my bot fly victim in the house, but a large pregnant doe who got the snuffles due to the high humidity and heat. In doors her lungs can heal. This means I may have a litter of giant rabbits in my house. Not something I’m looking forward to. My solution to this is to build an underground ice-house. Yes, an old fashioned freezer. Something with an angle and opening small enough to keep the cool in, and large enough not to keep the rabbits out. If they can get to the ice year round, then they will not have bot flies, snuffles, or heat stroke. The digging of this ice-house will have to wait until I do a bit more research on the project, however this time next summer, my bunnies will have air-conditioning. This is also the time of year many native fruits are ready. A lot of them I bet you pass right by. 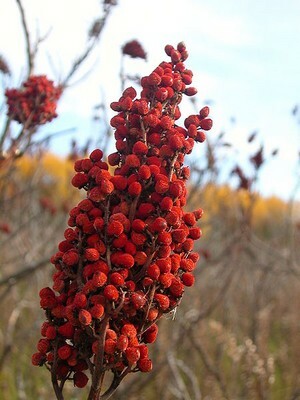 Sumac or "buck brush" is a plant that has been forgotten by most people. Sumac is medicinal, as well as tasty. Sumac pudding too is wonderful! Mix the berries with the flour or cornmeal. Add slowly and always stir the cold water. When this is done, pour slowly into the hot water. Stir constantly. Add 1/2 cup to 1 cup sugar to taste. Also Apricots and raisins are common things to add. Remove from the stove and allow to cool. Eat hot or cold. Some people like this on cake, or ice-cream. I like it on ice-cream personally. Boil water and soak sumac berries in it. They have a wonderful lemon flavor and beautiful rose color when soaked. Add honey or sugar to taste, mint is very good with this. Cool, and enjoy. Thanks for the investment of your time to help me learn more about this subject. if i saw you in person i would give you a big hug.